After recent discussion with venue management, the post-typhoon recovery work at the original venue of Stage 10 event of SPORTident Y2Y Park Orienteering Tournament 2018 could not be completed in time. Therefore, the Stage 10 event will be postponed to 10 Nov (Sat) and changed to Duckling Hill. Our sincere apology for any inconvenience caused. Registration platform for stage 9 &10 has been reopened for new participants. Please register on https://www.race-easy.com one week before the event. For enquiries, please contact us via email (park@orienteering.hk). LCSD recently informed us that the fallen trees in North District Park would take a longer time to clear. As such, Stage 9 event of SPORTident Y2Y Park Orienteering Tournament and stage 3 events of Y2Y Trail O Tournament will be postponed to 17 November 2018. We are also working on the arrangement for stage 10 event and will announce any update in due course. For enquiries, please email us at park@orienteering.hk. Park Orienteering is a kind of Sprint Orienteering which requires runners to have good route choice and physical fitness to excel. In a park orienteering competition, runners will be given a map with checkpoint location. They can opt for any route choices based on the information provided on the map. Y2Y will be organizing Y2Y Park Orienteering Tournament 2019 from May to October with a total of 11 stages events. We are honoured to have the support from Acti-Tape, FIREE, SPORTident and Sportsoho for this year’s events. Adhering to our principle of constant innovation, in addition to the usual competition venue in parks, more new competition area will be introduced. Join now to enjoy the fun and excitement in running and navigating in different parks in Hong Kong. Y2Y TrailO League 2018 will be held at the same venue on the same day! Petzl HK Night City-O League 2018 will be held on the same day! Family class is for teams made up of 2 to 4 direct relatives. There should be at least one member aged 18 or above and another one aged 13 or below. Miniknat will be held as line-O format. Participants will follow a designated route and parents may join kids in Miniknat and enjoy the run of orienteering together! Mini prizes will be given to kids after they have completed the course. **The age of participant is counted on 2019-12-31. Special discount for enrolling multiple stages at once! Participants who wish to obtain a participation certificate for each stage should indicate in the entry form. Free for joining 7 stages or more at once! Top 3 participants in each class in each stage will be awarded with medals. Your best 7 results out of the 11 stages will be counted towards your overall result. The overall champion in each individual class will be awarded a SIAC sponsored by SPORTident. Your best 7 results out of the 11 stages will be counted towards your overall result. The overall champion in each individual class will be awarded a champion jersey sponsored by FIREE. Your best 7 results out of the 11 stages will be counted towards your overall result. The overall top 3 in each class will be awarded a trophy. The first orienteering tournament in Hong Kong employ SPORTident AIR+ timing & punching system. SPORTident AIR+ (Contact free) electronic punching system will be employed in all stages of Y2Y Park Orienteering Tournament starting from 2018. Participants may purchase it with discounted price $550 (Original price: $700) or rent SIAC ($30 per stage) from Y2Y, or use own SIAC or traditional SI cards for the race. It is optional for participants to use SIAC in any stages (Except stage 3), yet participants can only punch SI units in traditional way. Contact free function is not available to traditional SI Card users. Please be noticed there will be special arrangement for stage 3 (OAHK Ranking). Use of a SIAC is mandatory. You may use your own SIAC or rent one for free (Only for stage 3). 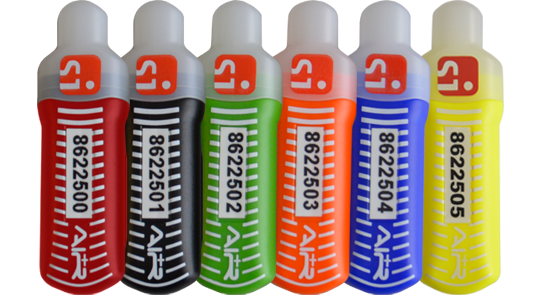 We offer SIAC at a discounted price! 2. Online group registration and pay by cheque. Available for 5 competitors or more only. Please contact us via email to acquire Excel entry form. 1. 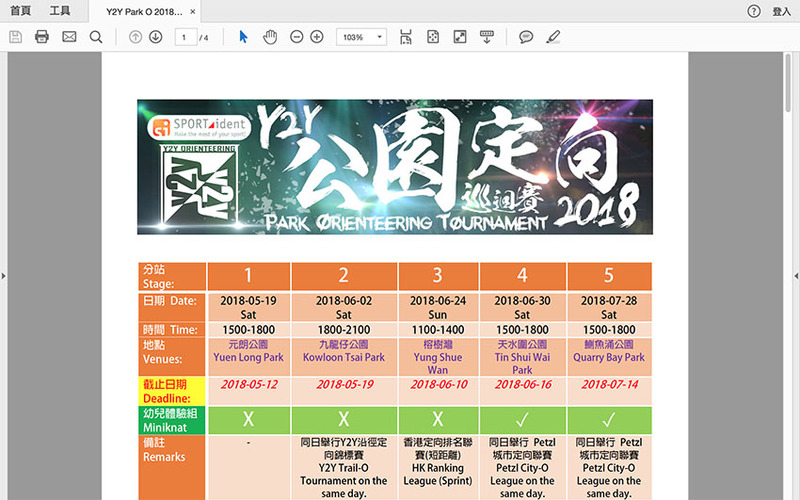 Event information will be uploaded on website: https://park.orienteering.hk 5 days before the event. Participants must check the event information on their own. 2. SPORTident AIR+ electronic punching system will be used. Particpants may purchase, rent or use own SIAC/SI card for the race. Please use the rented card with care. 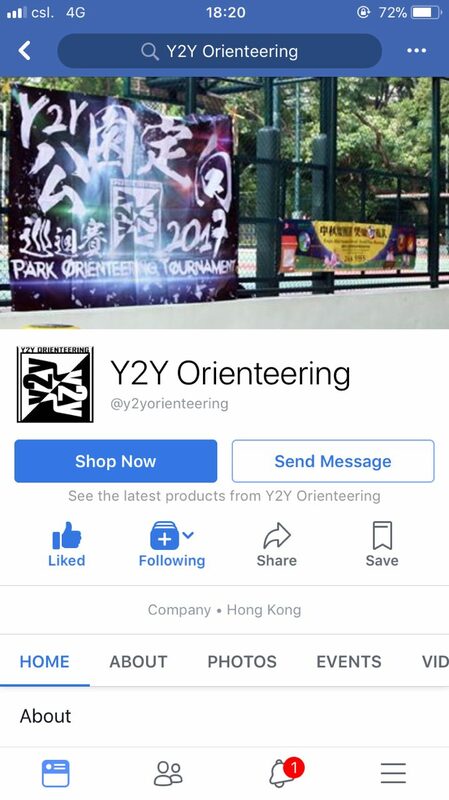 If the rented control card is lost or damaged, participants are required to compensate HK$700 to Y2Y Orienteering Development and Training Centre. 3. The results of 3rd stage park-o will be counted to the OAHK Hong Kong Orienteering Ranking League 2019 (Sprint). To gain ranking score, competitors must become a valid member of OAHK at least three weeks before the 3rd stage event. You must also enter in the class corresponding to your Hong Kong ranking class to count for ranking scores in the race. 4. Public Liability Insurance is covered by the organizer. Participants/Parents are advised to apply their necessary insurance. 5. The organizer reserves the final right for any amendment, including but not limited to change of competition venues, date, time and race formats..